Back when Charles Dickens and his cohorts were publishing, books didn't come fully formed; instead, they came out in regular installments; that's why each chapter tends to end with a cliffhanger. 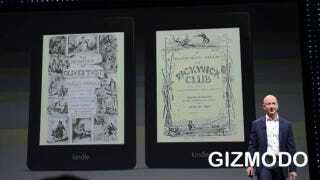 Today, Amazon announced that it's bringing that proud tradition back with Kindle Serials. The way Serials will work is that you pay upfront for an entire series, and receive all future episodes as automatic downloads as they become available. They types of books are what you'd expect from the format; mysteries, thrillers, genre pieces, etc. They'll be priced at a very reasonable two dollars, and while Bezos says it should spawn a new genre of books, in truth it's more of a blast form the past.